Bluetooth-enabled speakers enhance the audio experience of your laptop, smartphone or tablet. You are not bound to listen to quality music within the walls or at a certain place. 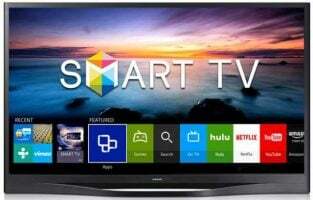 Go camping or hiking and still listen to music, play games or watch your favorite movies and videos with the same experience as you would at home. You don’t even have to spend a fortune to buy a Bluetooth speaker. 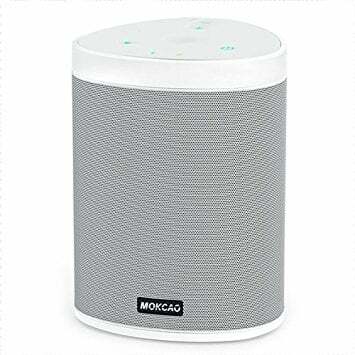 If you are looking for some suggestions then keep scrolling to discover the top best cheap Bluetooth speakers 2019. 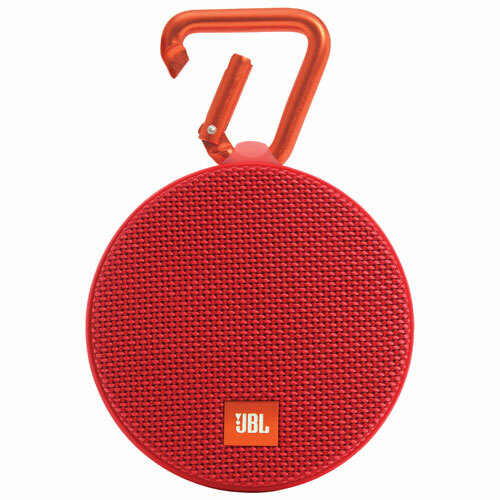 This attractive speaker from JBL is a small portable and waterproof Bluetooth speaker that comes with a neat hook that can be clipped on easily. Besides black, it comes in five more colors. There is a 3.5mm audio cable integrated with this speaker which can be used for connecting. It has a built-in mic through which you can make or receive phone calls. If you are looking for louder audio then you can connect it with another JBL Clip 2 speaker. 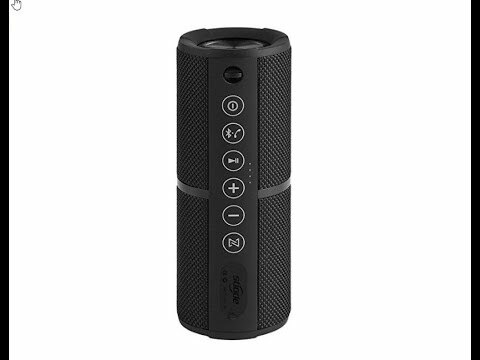 This portable Bluetooth speaker just seems to be small but the powerful 12W audio delivers unbelievable sound. The enhanced bass thunders from the dual neodymium drivers give the speaker this amazing sound. Whilst you enjoy a pounding bass there is no distortion in the sound. It features the exclusive BassUp technology and a patented spiral bass port boost port low-end frequencies which enable the beats to hit hard. The speaker is IPX5 certified so it is safe against dust, rain, snow or sudden falls. There is a 5200 mAh Li-on battery which lets you enjoy music continuously for a long time. The controls are simply flawless and you can take the speaker anywhere you like. This may be on the list of cheap Bluetooth speakers but the features offered are extraordinary. Available in two colors this, wireless Bluetooth speaker delivers more volume along with more bass. The DSP signal processing system is powered by 20W bass and 10W treble driver and passive radiators so you can enjoy sound in the entire room. The lows are deeper and the highs sound higher with this speaker so you experience full surround sound while paying through this speaker. If you are not far away from your device then you get a 33 feet wireless range. Syncing your device is hassle-free and takes a few seconds. You can connect up to 8 devices at a time and enjoy music or videos seamlessly. 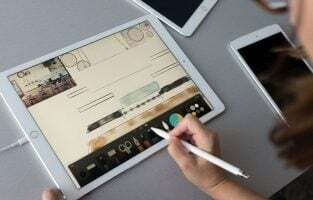 Reconnection to an older device is automatic and saves time too. 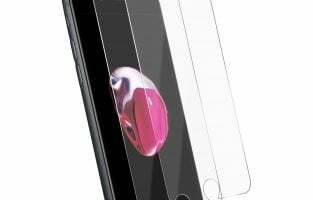 It is IPX4 certified and the silicone exterior paired with a metal mesh core is resistant to water, dust, sand and wear and tear. 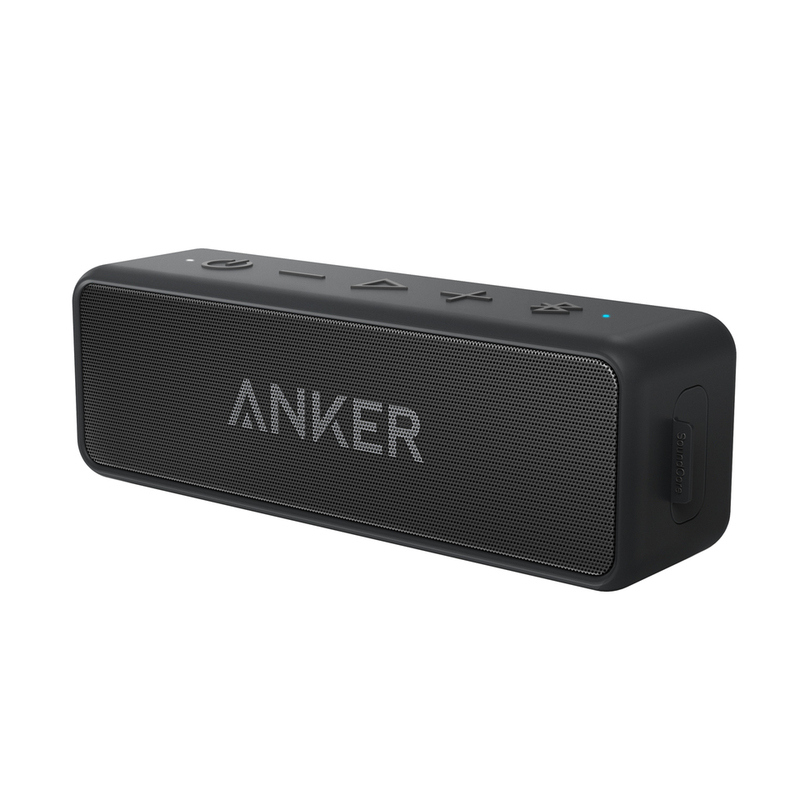 The speaker is meant for outdoor fun. 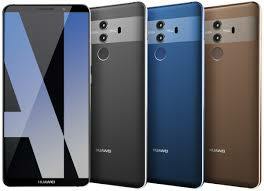 It also features a powerful 7500 mAh lithium-ion battery which will last about 5 hours of continuous playtime once you have it fully charged. There is an AC adaptor when you run out of charge. This is one of the best cheap Bluetooth speakers that you can buy in 2019. 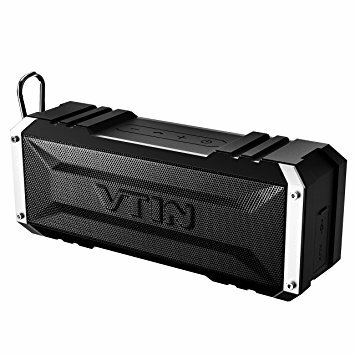 Whether it is a family picnic or a barbecue gathering you can trust your speaker from Vtin to deliver great music anywhere, anytime. There is a handy hook attached to the speaker using which it can be hung anywhere such as a backpack. The make of the speaker is sturdy and you can rely on its durability. Keep the volume as high as 70% and listen to music for 30 hours with just one charge. There is a 4400 mAh battery which lets you listen to music for so long. If you wish to party loud then the speaker delivers clear loud music for about 7 hours continuously at max volume. It is splash and crash proof so you can carry it around to the beach or on a rainy day easily. 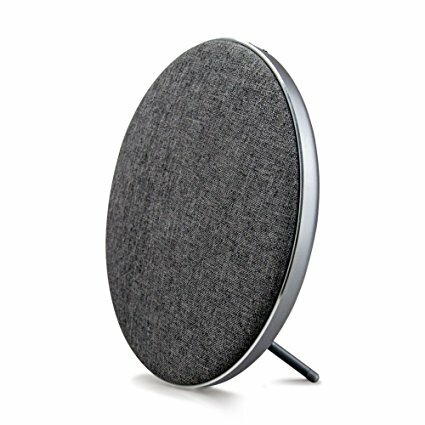 You can connect your iOS, Windows and Android devices to this speaker wirelessly maintaining a range of 33 feet. There is an AUX cable included that can be used to connect other music sources. 20 W drivers deliver remarkably clear and crisp powerful sound which is completely free of any crackles or distortion. This Wireless Bluetooth speaker from JONTER looks beautiful and you have three color choices. These 5W*2 speakers deliver incredible sound with full range output. The sound is powerful, clear and has a rich bass so it covers the full room. The music from this speaker is overwhelming, loud and distortion free. There is a built-in mic so you can receive all calls even if your mobile is connected to the speakers. The quality of sound is so good that all genres played through this speaker sound magical. There is an inverted V-shaped stand attached to it so you can conveniently place it anywhere. The controls are easy to use and well-highlighted so you can use them even in a dim lit room. The ports and slot are located behind the speaker, and operating is pretty simple. You can just save all your favorite music in a TF card and connect it to this speaker and listen to music without any device. The aluminium makes it durable and the soft front makes it look quite attractive to be placed on your table. The manufacturer offers a lifetime guarantee for this speaker. This Bluetooth speaker delivers quality sound in style. There are 3 LED lights stacked which flash 6 different themes of color. All you need to do is tap the mesh to change the theme. You need to tap and hold the mesh to turn the lights ON and OFF. You don’t need to have the speakers working, for the lights to work. They can be used independently as a torch. If you are listening to music to doze off to sleep then just click a button and the speakers will turn OFF automatically after 20 minutes. You can use all types of Bluetooth devices to play music, micro SD card, Aux cable and USB. You can operate it by touch and run it for about 8 hours of music along with the LED lights on. For this price, it is one of the coolest cheap Bluetooth speakers to own. 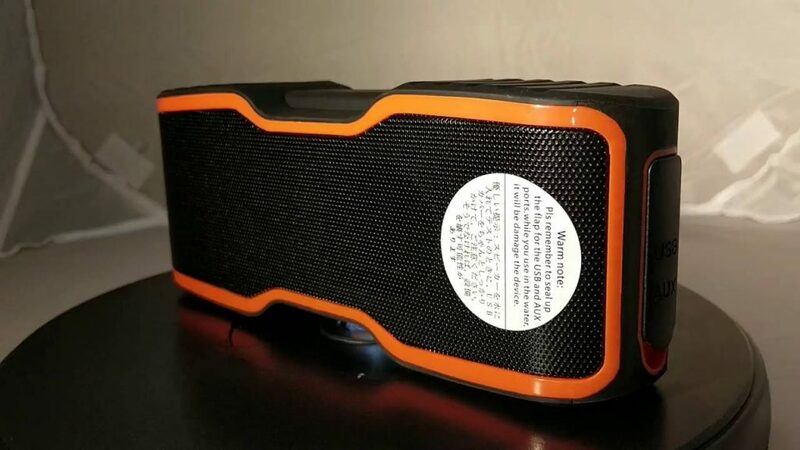 This product from Sbode is a high-quality portable speaker which delivers digital sound. It features noise and wind reduction technology and the speakers and bass radiators on each end delivers premium quality sound that is perfectly balanced. It is great for house parties and for outdoor activities too. The True Wireless Stereo function lets you pair two more Sbode speakers for enhanced sound and to cover a bigger area. Its exterior is made of woven mesh which is not only rugged to feel but makes it durable too. It has a triple protection design and will endure rain, water, dust and sand. You can even clean it with running water – convenient isn’t it? However, remember the speakers shouldn’t be submerged in water completely. You also get FM radio with this speaker and a built-in mic lets you take calls hands-free while you are enjoying your music through your smartphone. Whenever it is on a standby for over 10 minutes the power turns OFF automatically. You also get automatic pairing if you are using the same device again. With an IPX7 certification, this speaker is completely water-proof. This also makes it dust and snow-proof and shock proof. You get to hear crystal clear sound through the 20 W powerful loudspeakers without any distortion. You can attach another AOMAIS Bluetooth speaker to create a left and right channel and enjoy more powerful music and enhanced surround sound. The exterior layer of this speaker features a rubber material which shields the speaker from any scratches or other accidental impacts. 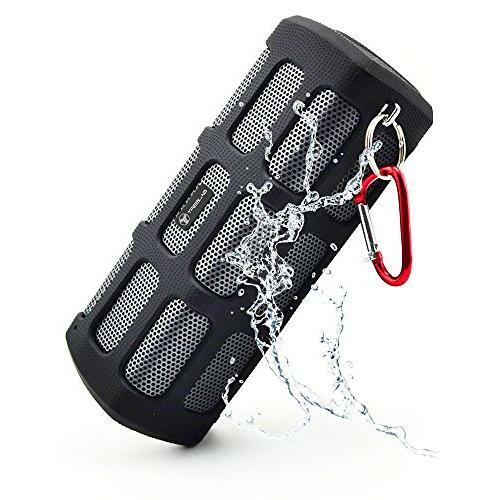 A speaker with such durability is perfect for hiking and other strenuous outdoor activities. It works with Echo Dot, iOS, Android and Windows devices. You can also use an audio jack provided with this speaker to connect to other devices. The speaker comes in two dynamic colours. 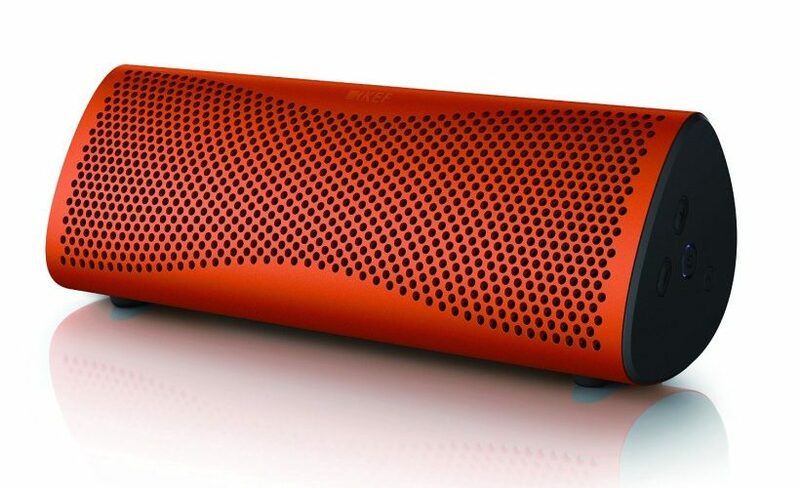 Durability at such as affordable price makes this speaker one of the best cheap Bluetooth speakers on the list. 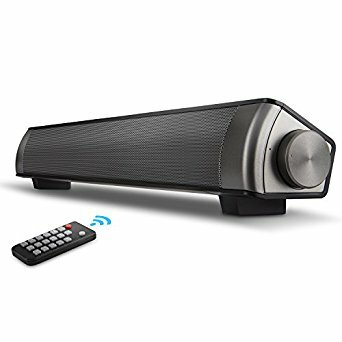 Next, on the list of top best cheap Bluetooth speakers 2019 is the Soundbar speaker. 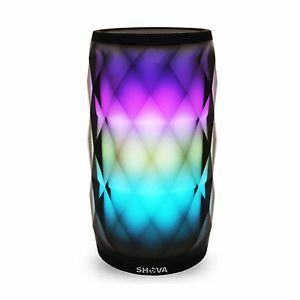 Add to the beauty of your home theatre system with this sleek and elegant looking wireless Bluetooth speaker. Covering a large area of up to 300 square feet this speaker delivers loud and clear sound up to 80 dB. Its anti-noise technology gives you a rich experience of sound through it. You can use it with your TV, smartphone, computers etc. Besides the manual controls on the speaker, you also get a remote which you can use to control it. Its slim design shouldn’t be mistaken because the sound that it delivers is awesome. It also supports TF card giving you added portability. The manufacturer offers a guarantee of 30 days. 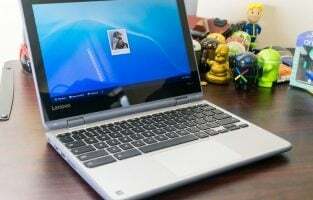 The company also offer technical support for all their customers. This powerful speaker is made specifically for outdoor activities. You can carry it anywhere you like – fishing, golfing, camping, picnic or a beach. It is an IPX4 certified speaker and shields from dust, water and accidental shocks. You don’t have to fear while keeping it beside a pool because splashes of water will not damage the speaker. The bass is amazing and the thumps in the audio will make your party a super-hit. It delivers a distortion-free sound so you can go ahead and max the volume of the speaker. You can connect almost all types of devices through the speaker to stream music. The controls are ergonomic and you also get notified about your battery going low through a blinking LED light. These are some of the best cheap Bluetooth speakers you can buy right now. Even though they are affordable, they have some pretty awesome features, so no matter which one you buy, you’ll be super satisfied.